When it quietly closed last weekend, the venerable Minneapolis restaurant departed with a whimper. But it certainly didn’t start that way. In its heyday, Rudolphs was an influential player in the local dining scene. 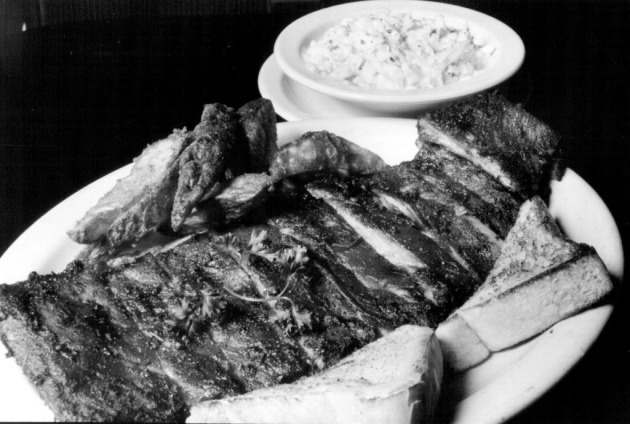 If nothing else, the 43-year-old ribs joint (that's a 1989 image of a whole slab of barbecued spareribs, with fries and coleslaw, priced at $15.95) had a significant role in igniting a late-night dining scene in what had been -- and in some ways continues to be -- an early-to-bed town. There were periods when the doors remained open to 4 a.m., an after-hours schedule that lured a lively, see-and-be-seen crowd from the worlds of theater, sports, music and restaurants. For years. The restaurant’s most glittering night-owl denizen was Prince. Early in his career, he lived around the corner, and that proximity turned him into a regular. When owner Jimmy Theros opened Rudolphs in 1975, the place didn't look like a typical barbecue joint. The walls were covered in Hollywood memorabilia, and the menu bestowed movie stars’ names on various dishes, making Rudolphs an early iteration of the eatertainery. Theros had an immediate hit on his hands, and the original Lyndale-and-Franklin location quickly spawned a few siblings. By 1978, there was a second Rudolphs, at 815 E. Hennepin Av. in Minneapolis, and a year later a St. Paul edition sprouted at Fairview and Randolph; in the mid-80s, that location was replaced by a larger branch in downtown's Galtier Plaza. In the mid-1980s, Rudolphs licensed branches in Duluth, Coral Gables, Fla., Akron, Ohio, and other locales. Theros ran an inventive and memorable print ad campaign, riffing off the restaurants’ silver screen aura. And he extended the Rudolphs brand into local supermarkets, selling the kitchen’s coleslaw dressing and barbecue sauce in bottles bearing the restaurant’s eye-catching, apostrophe-free, art deco-esque logo. Ever the showman, Theros took a theatrical turn in 1994 when he decided to renovate the original Rudolphs. At first, he considered closing the place during construction. Then, he “sat thinking one day about what the changes entailed - moving windows, walls and exterior doors, including the main entrance - and decided he wanted to ‘make the remodeling process fun instead of painful,’” wrote Star Tribune staff writer Jim Fuller. “He thought it would be amusing to turn the restaurant's exterior into an oversized blueprint for the upcoming changes. He called a franchise manager for College Pro painters and cut a deal. The painters will sketch the new doors, windows and sidewalk café area in dotted lines on the building exterior and get a few ‘all you can eat’ dining sessions in return." Several signature dishes spawned endless curiosity and interest, especially that creamy coleslaw, which generated frequent letters to the Taste section's popular restaurant recipe request column, a feature that ran for nearly 30 years. 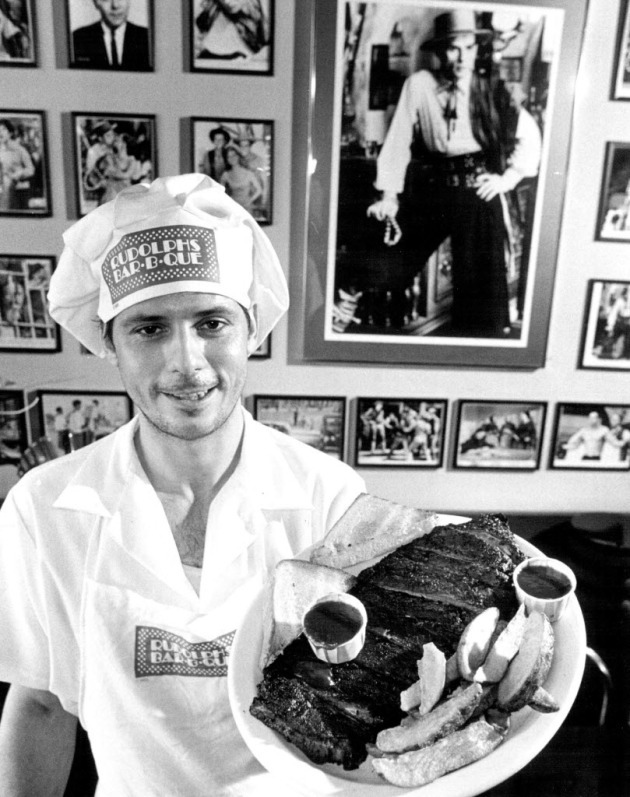 (That's kitchen manager Kenny Frazee with the "Humphrey Bogart" platter in a 1985 Star Tribune file photo, above). The response never changed, and the Star Tribune never published the recipe, or any Rudolphs recipe. “The new place is called Rudolphs and occupies the premises at Franklin and Lyndale Avs. that for several decades were occupied by The Gables 3.2ery. The interior of the old place has been completely redone in rough-sawn, unfinished pine and decorated with old movie posters and still photographs — the name comes from a preponderance of Rudolph Valentino memorabilia. "Seating is provided by canvas director chairs, which combine perfectly with table height to provide correct elbow support for two-handed rib-gnawing, which of course, is the only respectable kind. "One side of the menu offers steaks and hamburgers for barbarians, while the main attraction is a selection of barbecued spareribs or beef ribs, sliced beef or pork and chicken. These are given arch names like The Cecil B. DeMille, the Joan Crawford, The Humphrey Bogart, etc. 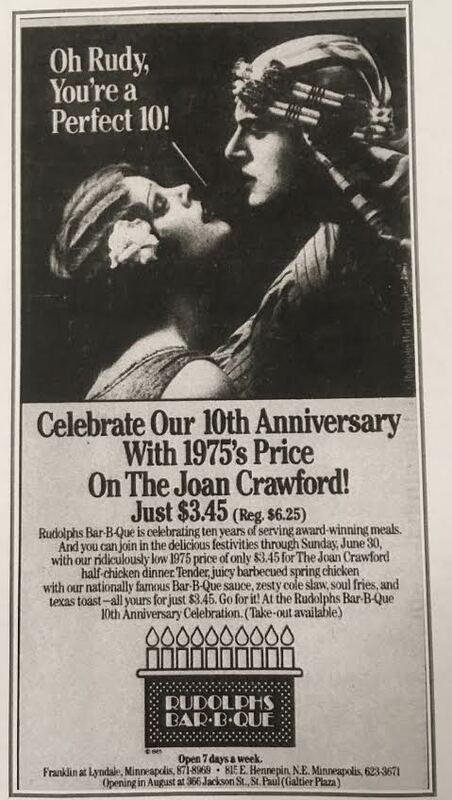 “I ordered the plain old Rudolphs Bar-B-Que spareribs ($4.50), upon being assured that it was a smaller portion than the Bogart (“a whole slab”). I was presented with a large platter carpeted wall-to-wall with wide-gauge, meaty, juicy and very tasty ribs, of which I could manage to eat only about half. The Bogart ($5.75) must be served on a stretcher. "The glamour gal of ribs joints, Rudolphs Bar-B-Que, is in a class by itself. Putti, plants, photos and stained glass supply the set for this Hollywood-style member of the ribs community. It does not have an owner but a ‘director,’ Mr. Theros, and its customers include art, music and theater people. "Rudolphs mega-pit is gas-fueled, and the dressy plates of rib slabs have a somewhat superficially smoky flavor. The cold beer in elegant chilled mugs is a welcome accompaniment to meals; Rudolphs also is the sole barbecue purveyor to have a wine list and cutesy names for its offerings. One can select from the huge menu a “Rudy” —$4.75 for spareribs only, or pay top price ($6.95) for a “Duke,” which includes a barbecued T-bone. A high point occurred in 1983, when Rudolphs swept three out of five first-place awards at the National Rib Cook-Off in Cleveland, competing against 39 restaurants from 22 states. Rudolphs took home top honors in the Best Sauce, Best Spare Ribs and Best Overall categories. 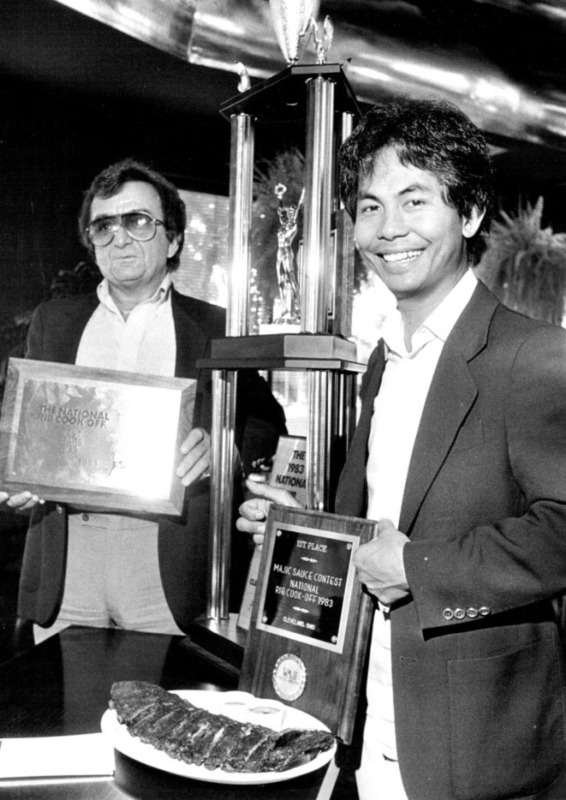 (That's Theros, left, and Tommy Ratanos, right, with their trophies, in a 1983 Star Tribune file photo, above. The contest also included a $10,000 prize; that's approximately $25,000 in today's dollars). As they usually do, times -- and tastes -- changed. In 1995, Theros filed Chapter 11 bankruptcy, allowing the business to reorganize and recuperate. The other locations all eventually evaporated, leaving only the Lyndale-Franklin bar-b-que mother ship. In 1997, Star Tribune restaurant critic Jeremy Iggers dropped in; he wasn’t bowled over. Still, Rudolphs plugged along for another 21 years, a remarkable feat in a cutthroat business. One factor that may have led to its demise is a sadly familiar one: parking, or the lack thereof. The restaurant lost its nearby parking lot late last year to the construction of an apartment complex. Rest in peace, Rudolphs. And thanks for the memories.